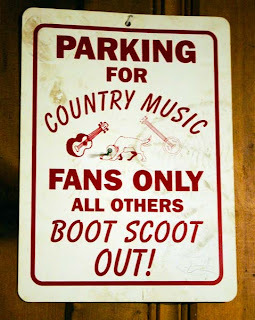 I am beginning to suspect that there may be hundreds of places in the Deep South where people get together for regular, usually weekly, country music jams. 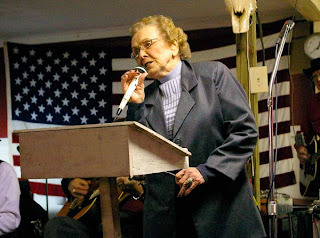 Though they're not honky tonks that's the preferred style of music, mixed in with some rock and roll and gospel. Some are run by families and some by local musicians and/or their fans. 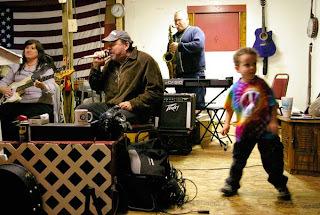 While there is a core group of regular players and audience members, newcomers are welcomed to sit in with the band at most of the places I've been to. 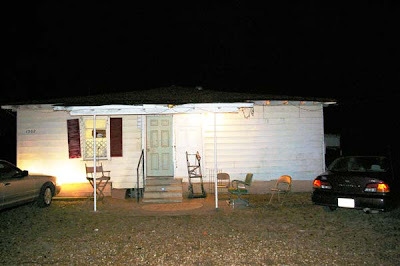 I've had a lot of fun at every one I've visited, but the Columbus Opry in Columbus, Mississippi is my favorite. Owner Benny Davis sets the tone with his great warmth, sense of humor and talent for letting it rip on electric and steel guitar. Benny tells a story about when he was a child and his Sunday School teacher asked the kids to pick a favorite song to perform in church. The teacher didn't say what kind of song, so he picked Hank Williams' "My Bucket's Got A Hole In It" which he'd been listening to on the radio whenever he got the chance. When it came time for the children to sing their songs, Benny was asked to go first. He sang "Yea! My Bucket's Got A Hole In It, Yea! My Bucket's Got A Hole In It, I can't buy no beer..." to what was was surely a vast sea of raised eyebrows. After that he says his mother grabbed him by the hair and gave him the whoopin' of his life. To this day he still won't sing that song but he's created a place where people can go with their friends and families and sing anything, secular or sacred, that they like. Drinking, smoking and cussing aren't allowed at the Opry and kids are free to knock themselves out singing and dancing or playing hide and seek outside. A Chief of Police Sings "Mind Your Own Business"
She's there every Saturday with her husband Hap who plays guitar and son John who plays drums and sings. The Hammonds are also working to help Benny keep the Opry going. Donations are gratefully accepted and the lottery of donated items is a fun way to raise funds. (I've won some excellent sweet potatoes and pecans myself.) All the money collected goes towards paying for the property and utilities. So far, they have put in central air conditioning, enlarged the stage and put in a concession area where you can buy hot dogs, popcorn and soft drinks. An electric sign awaits a tall concrete pole required by the city. 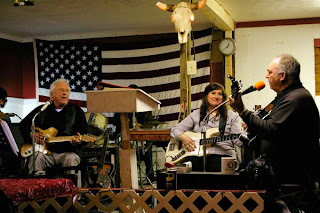 The Columbus Opry runs from 7:00 to around 10:00 every Saturday night. Regular Musicians (singers are marked with *) are: Violin: Jim Fain*; Finger guitarist: Gene Reed*; Rhythm guitar: Ron Bailey*;Lead guitar, fiddle, banjo, harmonica: Benny Davis*; Rhythm guitar: Hap Hammond; Bass: Linda Garrard*; Guitarist: James Cumberland*; Guitarist: Leon Winters; Drummer: John Hammond,Jr. * Singers not on-stage include: Carolyn Reed, Denzel Aldridge, Ruby Bell, Dale Cumberland, Hilton Hammond, Ruth from Aberdeen has joined lately (sings gospel), Doyle Spears picks and sings when he is there. How to get there: From the East take Highway 82 to the first exit in Columbus (Hw 12/50). From the west, Hw 12/50 is the last Columbus Exit off of Highway 82. Go East on highway 50 for approx. 1 mile. You'll come to a 3-way Stop (2 gas stations at the intersection ) and turn left onto Gardner Blvd. Go approximately 1/4 of a mile. There will be two 40 mile/hr signs, after the second 40 mile/hr sign the Columbus Opry is on the first alley on the right which is a dirt/gravel road. The alley is in between Jerry's Upholstery and a Pawn Shop. The Opry is a small white building on the right. There are a couple of places to stop for dinner on 50 before you get to the 3-way intersection. Martie's Steakhouse is on the right and Doug and Hazel's Drive In is on the left. I can vouch for Doug and Hazel's, the food is good (particularly the Chicken Fingers) and it's decorated with tons of Elvis posters and memorabilia. 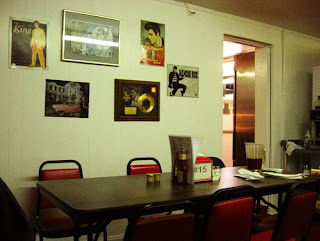 I heard that Elvis actually ate there once, but the waitress denied that. Hilton says that even though Martie's looks like a barn, it's nice inside and the food is good.